Healthcare systems must be interoperable so data is available to both patients and providers regardless of the care setting. Here’s how MEDITECH supports interoperability initiatives both locally and nationwide. 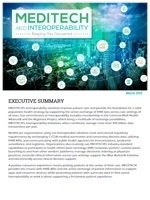 CommonWell Health Alliance was formed in 2013 to develop and deploy a vendor-neutral platform that enables scalable, secure, and reliable interoperability. The platform supports health data exchange nationwide to improve patient care quality and safety. As a member of CommonWell since 2015, MEDITECH puts its customers in a prime position to take advantage of CommonWell services, which include sharing medical summaries with a greater number of EHRs nationwide. The Argonaut Project was formed in 2014 by EHR vendors eager to speed the development and adoption of the HL7® FHIR® standard across the healthcare industry. A collaborator in the Argonaut Project since its inception, MEDITECH is committed to increasing customers’ data exchange avenues. The Argonaut Project develops FHIR-based services to expand the sharing of EHRs and includes API infrastructure to support initial FHIR transactions. The Argonaut Project seeks to develop FHIR-based services to expand the sharing of EHRs. Part of MEDITECH’s Meaningful Use Stage 3 release includes API infrastructure to support initial FHIR transactions. MEDITECH has also developed its own apps to supplement both the patient and clinician experiences, including MHealth and MConnect. MEDITECH is involved in all state initiatives requiring organizations to report biosurveillance data, immunization records, reportable lab results, and cancer case documentation to public health reporting agencies. MEDITECH’s Emergency Department Management and inpatient applications, such as Nursing and Laboratory, yield data that supports our nation’s public health reporting efforts. With over 300 billion data transactions per year, MEDITECH is a proven leader in the interoperability movement thanks to our numerous interoperability models accommodating both established and emerging HIE activities. To learn more, download our full white paper.